Why Are An Increasing Number Of High-Income Americans Choosing To Rent? The percentage of high-income households choosing to rent is on the rise. High-income is defined as $150,000 and up. The Rent Cafe reports High-Income Americans Are the Fastest Growing Renter Segment — Up by 1.35 Million in a Decade. 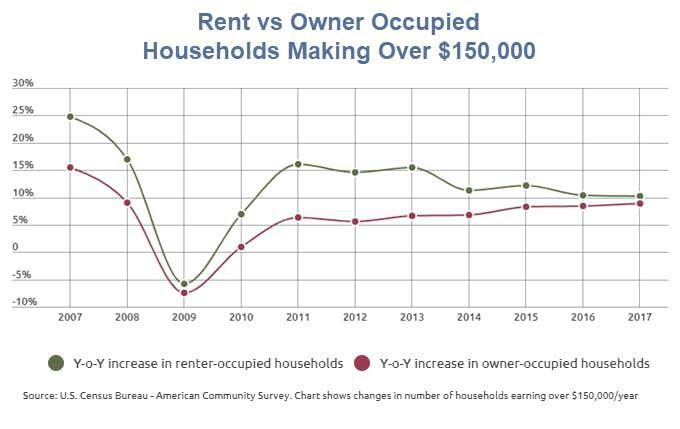 The most recent U.S. Census data tells us that the annual increase in the number of high-income renter-occupied households – defined here as those earning $150,000 or more – has been consistently faster than owner-occupied households. As a matter of fact, from 2007 to 2017, the numbers of those rich enough to own, yet who still prefer to rent grew by 175%. That’s compared to a decade-long increase of 67% in homeowners within the same income bracket. Of the 43.3 million renters nationwide, 2.1 million are top earners. 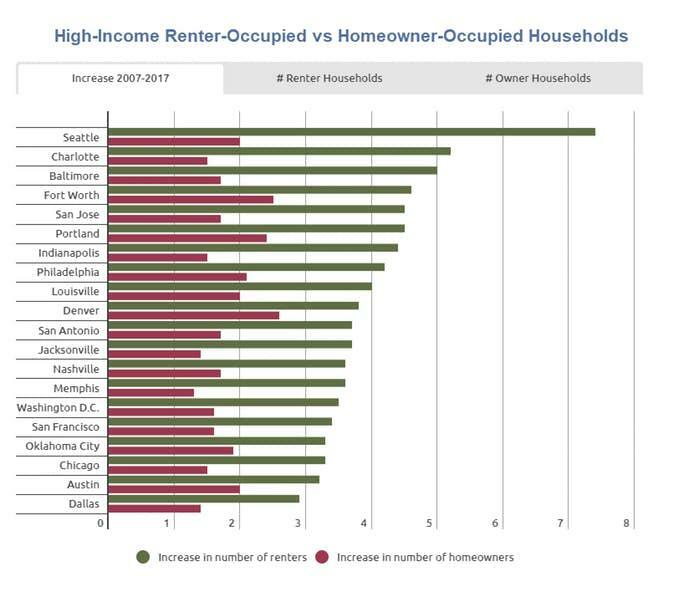 High-income renters represent the demographic that experienced the largest boom across the U.S. given that, back in 2007, there were only 774,000. 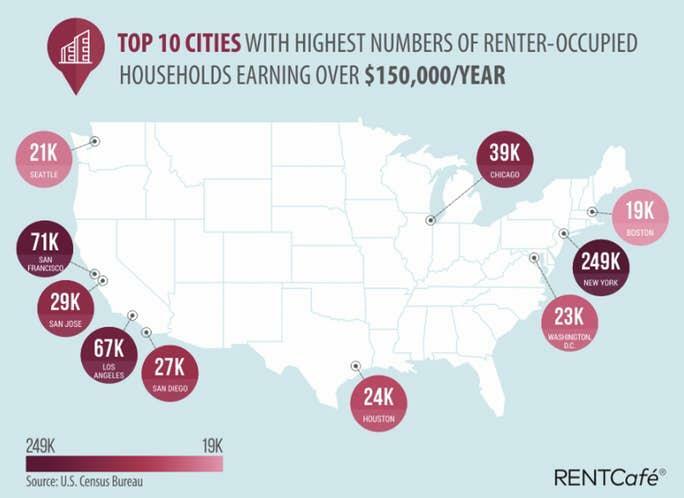 Arguably, $150K may not be enough to qualify as high-income in places like San Francisco or New York City, which is probably why the two cities have the largest numbers of renter-occupied households inside this bracket. NYC’s upper-bracket renters outpace owners not only in net numbers but also in the rate of increase. Wealthy renter-occupied households in New York doubled in the course of a decade, going from 125,000 in 2007 to the largest number of wealthy renters in the U.S. today — 249,000. As for people earning $150K or more who own a home in the Big Apple, their numbers have increased by a lesser 63% over the course of a decade (189,000 in 2007 to 306,000 ten years later). The Rent Cafe concluded. "The attitude toward renting at any income level is changing. With renters becoming the majority population in many U.S. cities, the spike in the national population of wealthy renter households could mean a change in attitude toward an American Dream that no longer belongs to this generation of renters." A Fed study on Consumers and Communities released last month had an interesting comment on homeownership. "We estimate that roughly 20 percent of the decline in homeownership among young adults can be attributed to their increased student loan debts since 2005. Our estimates suggest that increases in student loan debt are an important factor in explaining their lowered homeownership rates, but not the central cause of the decline." The rest is explained by changing attitudes and affordability. Attitudes about marriage, having kids, mobility, and debt have all changed. This is not 1960 or 1971. To top it off, houses simply are not affordable. 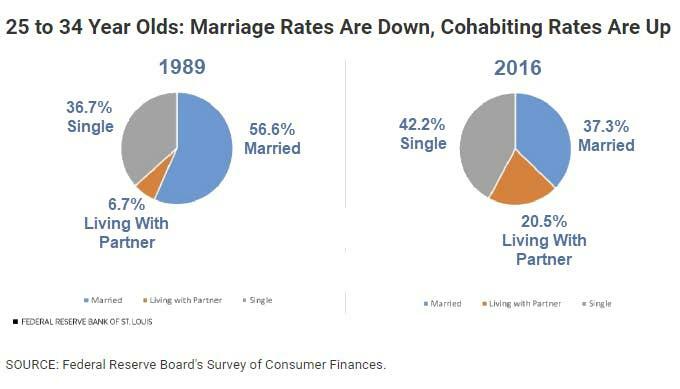 That's what the cohabitation rate shows. Wages have not kept up with home prices even without the burden of student debt. Even when high-income households can afford a house, many choose to rent instead. Why? Changing attitudes about the "American Dream". Reader "Cecilia" thoughtfully added "Liquidity and Walk Away Arbitrage", which also ties into the remarriage issue. Remarrying can greatly complicate divorce financial arrangements. It’s easier to live with someone. No one wants a second divorce, especially if the first one was messy.